I was not interested in the Fine Cooking magazine, that is until I looked at their 2007 cookbook. I have had the book for a while but there were always other books that I wanted to cook from. It has sat on the bookshelf for much too long. I had bought both yellow squash and zucchini which I used for this recipe plus other vegetables, we like. I must have used more of the spice than I thought because it was quite spicy. I thought it was fine though. This makes a colorful dish for the table. It doesn’t always happen but I like when the table is attractive because of the food. This is a dish that lights up the area. Heat a large skillet over medium-high. When hot, add 2 tablespoons of the oil and let it heat. Add the onion, season with a little salt and saute until translucent, about 2 minutes. Add the bell pepper and a little more salt and saute for another 1 to 2 minutes. Transfer the pepper and onion to a bowl. Turn the heat to high and add the remaining 1 tablespoon oil and the squash. Season with salt and saute for 3 or 4 minutes, stirring only occasionally, so that it begins to brown lightly and the flesh turns slightly translucent and is pleasantly tender . Return the pepper and onion to the pan, add the corn, and cook for another few minutes. Season with a few grinds of pepper, the cumin and chili powder . Toss in the cilantro, the lime and toss and serve immediately. 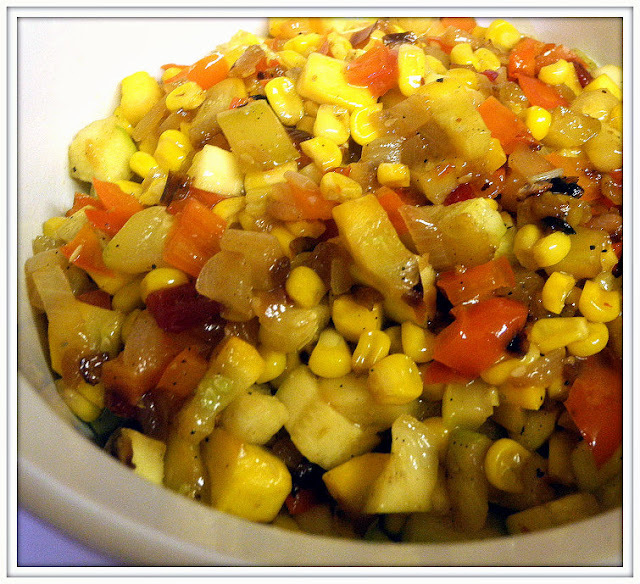 Super yummy side dish! Thanks for sharing on Simple Supper Tuesday. This sounds sooooo good. Thanks for sharing. You always have the best recipes. I will be making this over the summer. The produce you've used and the color of the dish look perfect for summer. Thank you for stopping by and linking!